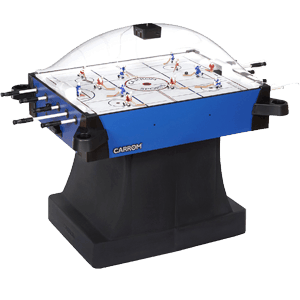 Just as foosball is the tabletop version of football, bubble hockey tables offer the same kind of thrill and game play for hockey fans.Itching to play a tabletop version of hockey? Here are some reviews of the best bubble hockey tables as well as bubble air hockey table models around, with portable and “official” models included. Click to replace anchor text there are a lot of NHL fans to satisfy, after all, and these games can be serious in places like Canada and Minnesota. The NHL attracts about 20 million attendees for its regular season games every year. And for fans who live in warmer climates, at least these tables can still offer gaming for diehard players. 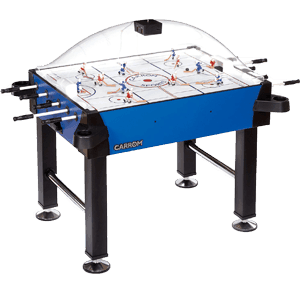 The best bubble h﻿ockey table﻿﻿ for you will depend on a lot of factors, but the most crucial one will probably be your budget.More over the below comparison give you a idea about cheap bubble hockey tables as well as tabletop bubble hockey. 23 x 14 x 3 inch. 58 x 47 x 45.25 inch. 60 x 54 x 30 inch. 37 x 19.75 x 3 inch. 58 x 51 x 33.75 inch. We’ve compiled a list of several game tables that may meet your budgetary requirements. But whether they’re affordable or expensive, we’ve made sure that they’re all fun. 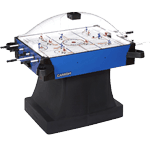 So which is the best bubble air hockey table for you? This depends on your budget, although of course that’s hardly the only factor you should consider. Here are some excellent options that may suit your needs. 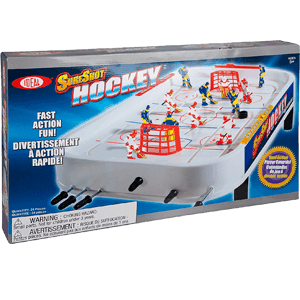 This miniature hockey tabletop game is surely ideal for those who don’t have the serious bucks for more expensive bubble hockey tables. It’s extremely affordable, and you can even get this for less than $30. 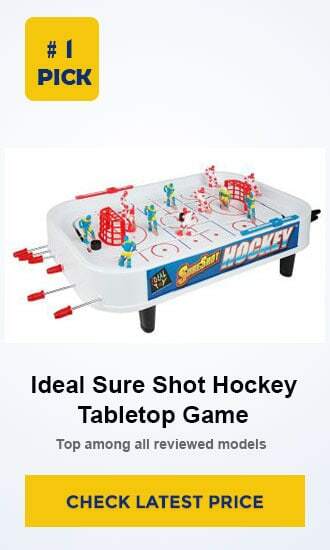 When you realize later on that some bubble hockey tables can cost thousands of dollars, the word “bargain” for this tabletop game can seem like an understatement. That’s not to say that it looks cheap. Sure it’s small, as it measures just 23 by 14 inches. It’s less than 3 inches thick. But that’s because it’s meant to be portable, just as a smartphone is small compared to a PC with a huge gaming monitor. It’s also a good enough size for very young kids, and it’s a good first step in indoctrinating kids to love hockey. Technically, this isn’t “bubble” hockey, as there’s no dome over the gaming surface. That’s because it’s not really needed. The puck is thick and relatively heavy, so it stays on the “ice” surface instead of flying around wherever. Players grasp the handles to move the playing figures and score goals.Say what you want about the price, but it sure doesn’t look cheap either. It has all the bells and whistles you’d find in a real game. The lines are all there, and even the player figures are detailed. The quality of the build is exceptional too, as it’s made by the same company that made the bestselling Slinky toy. Kids will love it, and many adults won’t mind joining in the fun. At this price point, we’re thinking every hockey fan family ought to have one to pass the time. Now we get to the hockey tabletop game with an actual bubble, and that means paying about a thousand bucks for this Carrom Super Stick. Despite the price (you can get it for a lower price if you find the right seller), many find that this offers a lot of value for the money. It’s fairly sizable at 47 inches long and 58 inches wide with the rods included. The players are in either red or blue, but you can buy a set of hand-painted players separately. The playing surface comes with protective coating to preserve the colors and graphics on the playing surface. Of course, there’s also the bubble top that keeps spilled beverages and dust from the table top.The rods used to control the players forward and backward don’t bend, and the rubber handles offer a nice grip. Playing this can really be exciting. Score a goal and lights and sounds come on. The electronic scoring unit keeps track of the score to minimize arguments about who is leading. 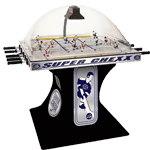 The puck return mechanism also resumes the gameplay after a goal. The scoring unit even shuts down automatically after 3 minutes of inactivity. It’s also very durable. The bubble is shatter-resistant. The perimeter is extra thick and so is the playing surface. The entire gaming cabinet is heavy at 140 pounds, so it won’t move while you’re vigorously pushing and pulling on the game rods. The cabinet and the legs are wrapped in heavy glossy vinyl, which resists denting and even regular wear and tear. 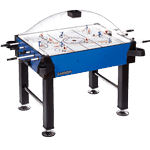 This best bubble hockey table easy to assemble, as it’s already preassembled except for the scoring unit and the legs. All in all, it’s great, and even the price is reasonable given other options. What if you want to have the official version and you can afford it? That’s very possible, since The NHL audience is actually the richest among all fans of other major sports. About 33% of the fans make more than $100K a year, while in the general population only 19% make that kind of money. So maybe you can afford this, as long as you’re ready to shell out more than $4K. 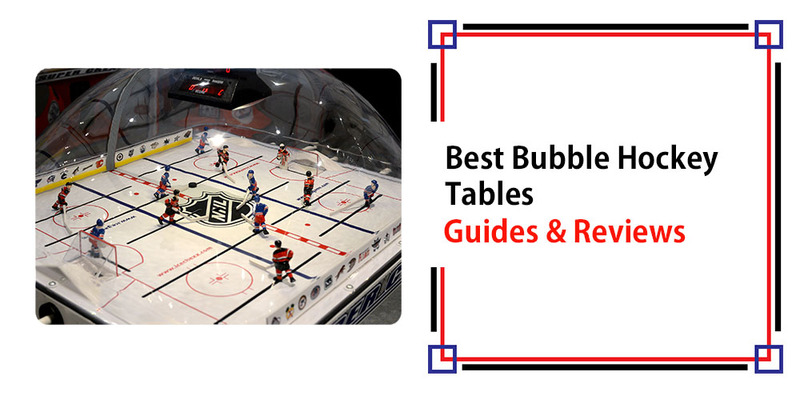 So what’s different here that you can’t get in any other bubble hockey gaming table? Sure it plays well and it’s very well-made. But the most important aspect here for fans is that the players are hand painted with the NHL uniforms you specify. You can pick which are the home team and the visiting team, while the sides and the base are festooned with the decals of the NHL and your favorite team. For NHL fans, who are extremely “tribal”, this is crucial because you can control your favorite team as you play. But there’s more to the realism than just having detailed players to play with. You have live action sounds, and the play by play is actually voiced by none other than iconic Sabres announcer Rick Jeanneret. The scoreboard is overhead just like on a real ice hockey arena, and it doesn’t just show the score. It actually shows shots on goal, the game period, and the running time. When time runs out, the team with the most goals wins. If it’s a tie, then there’s sudden-death overtime.The playing surface is ample at 60 inches long and 30 inches wide. It’s 54 inches high, and at 170 pounds it won’t move from its spot. Did the price of the ICE Super Chexx shock you? You can settle down your nerves by going back to a tabletop game with a much more reasonable price of about a hundred bucks. Yet this too offers official NHL team logos and colors. Each set has two teams from the NHL, and then you can add more teams simply buying extra packs at about twenty bucks each. This is cheap because it doesn’t have the bubble to cover the playing surface. But at last there are still some plexi-shield protectors behind the nets. And it’s a true tabletop model, as the legs are less than 2 inches long. It is 37 inches long and about 19.5 inches wide.The play is quite authentic, and you have marksmen along with a center forward and a left forward in the Gretzky position. The puck pops out of the goal to resume the play. 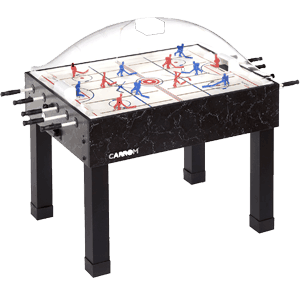 All in all, it’s a serious contender for indoor hockey table with most value for money. It looks great, it plays well, and the price sure is reasonable. This too offers a lot of realism, without feeling like you’re being overcharged. It’s offered at less than $2K, but some sellers can cut it down to less than $1.5K. That’s still a lot of money even for affluent NHL fans, but then you’re still getting a lot in return. This is a bigger table than the other Carrom on this list, as it measures 58 by 33.75 inches, and it’s 51 inches high. It doesn’t have legs, and instead you have a substantial base that sets the weight of the entire unit at 185 pounds. You don’t have to worry about instability. As it’s made by Carrom, it’s been built with high quality materials and its durability has been thoroughly tested. The passing and the shooting can go by fast, with the styrene surface and its custom graphic coating. The scoring unit uses batteries, and it tracks the goals while each score is greeted with sounds and lights. The score can be reset at any time, and it resets when you leave the game for a few minutes.The cabinet is made from heavy-gauge materials, with a durable Melamine surface. Don’t worry about the bubble, as it’s also shatter-resistant. It also comes with slide-on cup holders and protective corners. The edge banding on the cabinet perimeter is very thick, while the rods are made of solid fiberglass. It also has mechanism that prevent shearing and binding of the gears. It’s even easy to assemble. It’s already mostly assembled, and you just need to put in the pedestal, the scoring unit, the corners, and the cup holders. 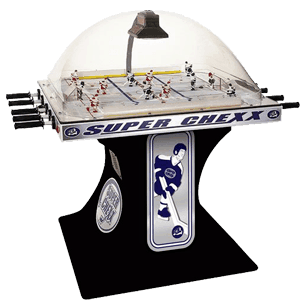 With all things considered, this is a bubble hockey table that will provide years of hockey fun. To sharpen your skills effectively, you need an equally effective companion. No other table comes even close to this one. It is indeed designed for beginners like you in mind. This is due to its simplicity and ease of use. In all, the table is made of the highest quality materials possible. It is as such resistant to most of the agents that cause deterioration. You will find it applicable for longer beside yielding you a higher degree of satisfaction. Its legs are not only durable but exude breathtaking appearances indeed. They are made of the heavy miter-fold timber and are also colored black. They resist the percolation of water and infestations by termites as well. The playing surface is coated with the styrene materials. This ensures an even playing surface that is devoid of bumps and other obstacles. You will experience smooth and unhindered ball movements besides satisfactory results. Surrounding the entire playing surface is the shatter-resistant plastic dome. The dome is transparent and highly visible. It accords you maximum visibility from just about every other angle. You will not encounter any mishaps at all by opting for it. Its scoring unit from those of most others. This is due to the fact that they are operated by batteries. They thus absolve you from too much fatigue and anxiety while playing your favorite game. Are you keen on spending your free time enjoying air hockey? If so, then you may wish to possess this ESPN premium dome hockey table. It is basically an arcade classic table that offers favorite pass-time whole families. The rods with which you use to engage the players are plated with chrome. They measure 5/8 inches long. For these reasons, they are breathtaking to behold, durable, and convenient to engage. They are also effective in discharging their roles. 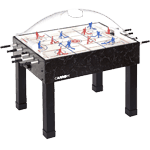 Unlike most other tables, the scoring mechanism of this table is electronic. It does the tallying and display of scores automatically. This spares you from too much effort besides simplifying your overall experience of the game. Each of the 12 players that make up the set is hand-painted. They are thus very legible for you to spot them even in moments of poor visibility. You will ever miss your targets at all times. 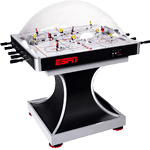 This best dome hockey table is clear dome is large enough and hemispherical in shape. It allows you to view the progress of the game from just about any angle you may deem fit. You can never miss any milestone or task in progress at all. Do we even have to explain the allure of this game for hockey fans? If you’re a fan, you already know. 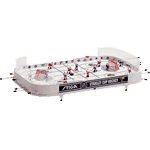 Here also present best bubble hockey table tips or bubble hockey reviews for purchase. So just get one, and there’s a model here that can fit any budget. 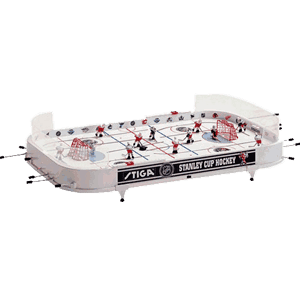 Watch a game live or on TV, and you can extend the excitement after the game or even after the season with the best bubble hockey table in your home or pub. To further enhance your experience of the game, the table comes along with the arcade sound effects. These highlight and respond to the various milestones by way of audible prompts. You will subsequently feel soothed and entertained as well.